Rice crispie treats are a fun and easy way to make a sweet dessert for everyone in the family. We love these from Healthy Nibbles and Bits, because they are flavored with the seasonal flavors of pumpkin. Bits of Oreo help make each bite a little bit chocolaty as well. 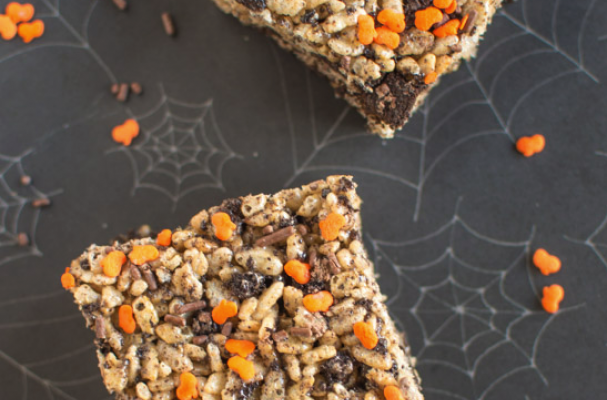 This is the perfect treat for classroom parties and you own Halloween party! Melt the butter over low heat. Add the mini marshmallows and stir until melted and smooth. Remove from heat and stir in the rice crispies until well coated. Cool completely before cutting. To store, wrap bars individually in plastic wrap. Once you make this recipe, add some of your favorite flavors and add-ins. We like mini chocolate chips and bits and other small candies. Adding some instant pudding to the marshmallow will flavor it and add a bit of extra flavor to the entire batch. Here are some recipes for you to try. Each one is delicious!